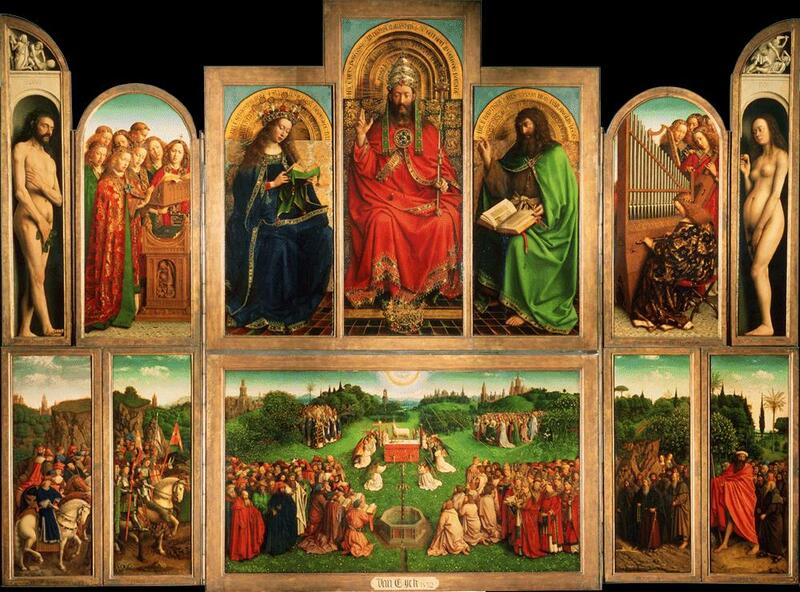 It was long asserted that Van Eyck invented painting in oils. 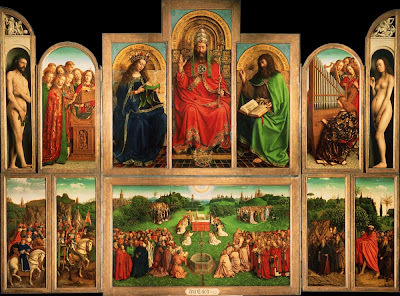 Art historians no longer consider this to be the case, but, together with his brother Hubert, Van Eyck did contribute decisively to the development of the technique of oil painting. Because he employed assistants, it has not yet been possible to ascertain the nature of his contribution to certain important works. Wealthy patrons made sure that their porteges lived well and could concentrate entirely on their work. After about 1424, Van Eyck worked for Duke Philip the Good of Burgundy who appointed his both court painter and official artist of the city of Bruges, in what is now Belgium. What made the achievements of the Flemish painters so important? First of all, they observed everything in the most minute detail: The human body, animals, plants and every day objects, what we see in their pictures appears within our grasp, and the proportions and detail correspond perfectly. Frequently the artist adopted an elevated perspective to give the viewer a bird’s eye view, and make pictorial space seem endless. The Flemish painters also broke with medieval traditions in their choice of themes. Generally, medieval artists chose to paint religious scenes, and paid little attention to landscape and background. The Flemish artists discovered the beauty of every daily life, placing people into interior spaces such as living rooms and bedrooms. This marked an important development: artists no longer orientated themselves exclusively towards God, but also focused on their earthly lives. For the first time the sacred and secular were combined in harmony.